This piece originally appeared on my BBC Blog to accompany our Bert Jansch feature, which was being repeated in tribute to the late songwriter and guitarist. I recently blogged about the phenomenon of 1970s TV-advertised compilation albums, a disgraceful episode associated with one of them (theft, perpetrated by me), and the long-departed budget record labels that gave them life. One label I neglected to mention was Contour, which sported a white and mid-blue centre label, a curvy seventies style logo and often released garbage like Glam Rock – Harpsichord Style. As far as I can remember the Contour record label was specific to a particular UK high street store. Or was that Hallmark? Or Pickwick? Small potatoes really, considering that what we are actually talking about here is yet another music theft (perpetrated again by yours truly). 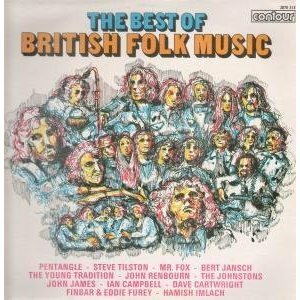 This time the album was The Best Of British Folk Music (Contour) and the victim was my dear old Uncle Ian. “That looks interesting,” I said, “could I borrow and promise to return it in a few days?” “My pleasure” says he. This was around 1980 and I had cause to reflect on what is probably now a bust promise while popping said album on my turntable last week. Truth is I held onto The Best Of British Folk Music for dear life; heavenly wonders, troubling mysteries, and oddball novelty weirdness lurked in every groove with treats that included Steve Tilston’s atmospheric I’m Reaching Out, the utterly barking Gay Goshawk by Mr Fox and Hamish Imlach’s gallus, galloping History Of Football. Two songs resonated more deeply though, Needle Of Death by Bert Jansch and a version of Lord Franklin by Bert’s group Pentangle. If the word monochrome was ever to be applied to sound, it would have to be the sound of Needle Of Death; somewhere in between the cracks of lyric, finger picked acoustic guitar, the hissy warmth of ¼ inch analogue tape, one microphone in a makeshift London recording studio and the mournful sound of Bert’s vocal, the songwriter manages to relocate you, chilling your feet under an umbrella at some scarcely populated graveside where a nameless mother weeps and a stoic father ‘stands in silence’. It is one of the great immutable works of 20th Century Art and one I was advised not to mention to its creator when I first met him at East Kilbride Arts Centre in the 1990s. Instead I enthusiastically asked Bert about Lord Franklin and told him I had just recorded it with my own group. Nonplussed, he mumbled something about Bob Dylan ‘nicking’ it for Bob Dylan’s Dream. “Oh,” I said, “Dylan’s just made a new album of traditional songs called Good As I Been To You.” “Is he still at it, then?” came the faintly amused reply. I raved on regardless, swooning over Bert’s vocal and guitar playing on Lord Franklin. “That was John Renbourn,” he said kindly, “the only thing I played on that song was the squeezebox and you can hardly hear it.” And still the ground refused to open up. When we got the chance to feature Bert Jansch, the album, in the first series of Classic Scottish Albums (it was one of the first blue biro entries on our canteen-napkin wish list) I warned original CSA Head Honcho Fiona Croall that any interview with the famously shy artist might consist of me babbling desperately for the price of a few ‘no’s and the odd ‘yes’; the seductive diffidence in Bert’s performing style, his reluctance to meet the camera head-on, the out-there guitar improvisation touched on and quickly abandoned, the awkward catch in the throat was no affectation. It, he, was the real thing, one-word answers included. As it turned out Bert opened up wonderfully, describing the recording of that first album with the same eye for important detail you find in the best of his songs. He talked about Needle Of Death, too, movingly and quietly, about his hatred of the vocal performances on the album and also that monochrome world of early 60’s London from which his vivid music (once removed from its Scottish roots) sprung. For now we say goodbye to this great artist with a return visit to Classic Scottish Albums: Bert Jansch.